With Wrigley and the Cell hibernating through yet another fall, Chicagoans craving World Series action must head over the Skyway to the Horseshoe Casino in Hammond, Indiana, for the World Series of Poker Circuit tournament at the Venue October 13–24. 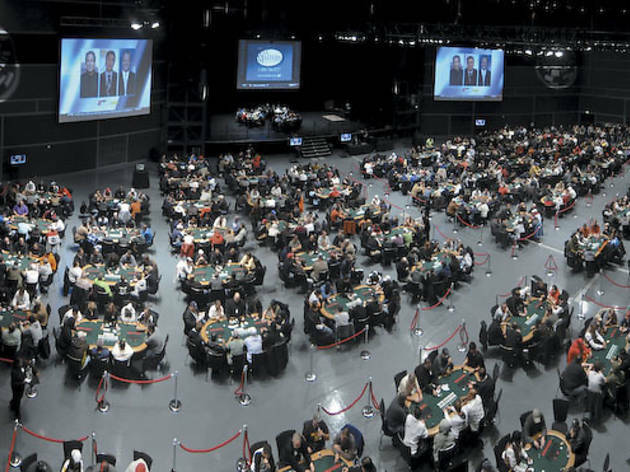 They’ll find themselves with plenty of company when they arrive: In its fourth year, the poker marathon should attract well over 1,000 players for the opening-day event, a $350 buy-in, no-limit Texas Hold ’Em showdown. In 2010, that event drew 1,611 players looking to take down a $350,000 prize pool. The main event, with a $1,600 buy-in, drew 872 players chasing a $1.2 million prize pool. By contrast, the main event at the Horseshoe’s inaugural WSOP Circuit tournament in 2008 drew only 165 entrants (albeit at a premium $5,125 buy-in level the WSOP has since abandoned to make the tournament more accessible to non-pros). 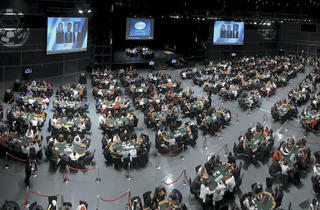 It all adds up to a dizzying array of poker action on 99 tables filling a theater that usually hosts live concerts. Twelve events, ranging from one to four days, reward winners with gold WSOP Circuit rings in addition to big paydays—the opening tourney this year has a guaranteed $500,000 prize pool, for instance. Beyond the ring events, players can enter nightly $150-buy-in Hold ’Em tourneys October 13–21, too many single-table satellites to count as well as several $250-buy-in, one-day mega satellites that reward the top three finishers with entry into the $1,600 main event. The big tournament, a four-day affair starting October 21, boasts a guaranteed prize pool of $1.5 million this year. Especially given the recent federal crackdown on online poker sites, a WSOP Circuit tournament offers the best action for American players outside of Las Vegas. In a nod to the pros, the calendar includes a few non–Hold ’Em opportunities as well, so Omaha and H.O.R.S.E. players will feel right at home at the Horseshoe. I played tourneys there in the first and third years, and the event’s explosive growth was shocking. The first year, I won a single-table satellite that included entry into a ring event, where I finished near the top third of a 270-player field. Last year, I busted out of a ring event after the second break and the room was still packed with active players. My advice: If you’re a home-game novice, dip into some of the lower buy-in single-day tourneys. If you play your cards right, you could end up with virtually free entry into a big event. “If you’re inexperienced, set your budget,” agrees special events manager Amie Hill, who’s been at the Horseshoe since 2008. “I would start small. If your budget is $1,000, maybe start with a satellite so you get more practice for your money.” And just like at the main WSOP in Vegas, there’s a wealth of cash-game action around the tournament play. The $1–$2 no-limit Hold ’Em tables in the Horseshoe’s poker room downstairs from the Venue will be hopping all 12 days, and they’re a great place to put in a hundred bucks and spend a few hours getting comfortable with the level of play. Best of all, unlike the 1919 Black Sox, this mixture of gambling and the World Series is entirely guilt free. The Horseshoe is a 17-mile shot from the Loop via I-90/94 East and the Chicago Skyway. Exit at Indianapolis Blvd, follow casino signs to 777 Casino Center Dr, Hammond, IN (219-473-7000, horseshoehammond.com).